Media captionInterim president of Haiti Jocelerme Privert: "It is very important to respect all the warnings from authorities"
One of the most powerful Atlantic hurricanes in recent years is expected to cause flooding and landslides when it passes by Jamaica and Haiti. The fast-approaching Matthew, a Category Four storm, could bring up to 40 inches (102cm) of rain. Heavy rain and winds have already hit parts of Jamaica, with floodwaters blocking roads in the capital Kingston. 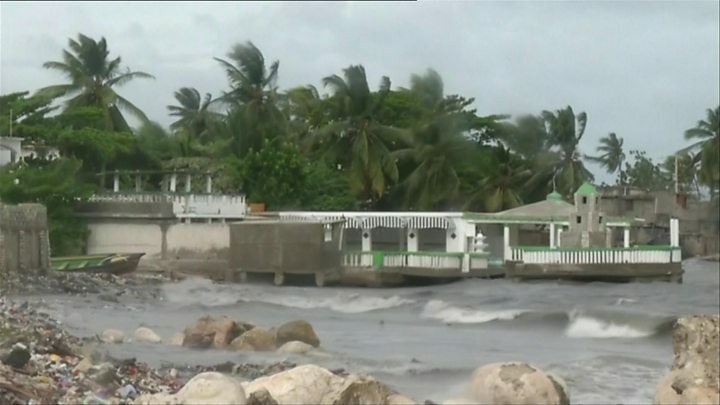 Haiti could be more seriously affected when the hurricane passes over the country's south-west. Haitian authorities have urged people to stock up on food and water and secure their homes. Thousands are still living in tents following a huge earthquake in 2010. The mayor of Haiti's largest slum in the capital Port-au-Prince, Frederic Hislain, has urged the government to evacuate some 150,000 people whose homes are threatened. Matthew is later expected to reach eastern Cuba, where a hurricane alert is in place for six eastern provinces and residents are being moved from low-lying areas. As it is moving slowly north over the Caribbean, the storm's maximum sustained winds are reaching 140mph (220km/h), the US National Hurricane Center (USNHC) said. Its centre is expected to pass to the east of Jamaica and make landfall on the south-western tip of Haiti before reaching eastern Cuba, the USNHC said. Southern areas of Haiti including Jeremie and Les Cayes are expected to see the worst of the heavy rain and treacherous winds. "Wherever that centre passes close to would see the worst winds and that's what's projected to happen for the western tip of Haiti," US hurricane specialist John Cangilosi said. "There is a big concern for rains there and also a big concern for [a] storm surge." The storm is expected to pass east of Florida through the Bahamas, although it is too soon to say whether it will hit the US coast. Haitian officials say that about 1,300 emergency shelters have been built, enough to accommodate 340,000 people. Both airports in Haiti are closed. Interim President Jocelerme Privert on Sunday advised Haitians to be prepared to move quickly. "To those people living in houses that could collapse, it's necessary that you leave these houses to take refuge in schools and churches," he said in a radio address. About 13,000 people were evacuated from high-risk areas in neighbouring Dominican Republic, which is also expected to get battered by rains and winds, according to the country's civil defence chief. In Jamaica, emergency services rushed to protect buildings. Long queues formed outside stores and at petrol stations as people stocked up. Matthew is expected to hit Cuba on Tuesday, potentially reaching the colonial city of Santiago de Cuba and the US Navy base of Guantanamo Bay. Have you been affected by Hurricane Matthew? Only if it safe to do so, you can share your experience by emailing haveyoursay@bbc.co.uk.